Dog and Pony Show | Retired Ponies Figurines | One Price Low Flat Shipping! Sedona wildlife artist Gene Dieckhoner has created a delightful tribute to our "faithful friends." 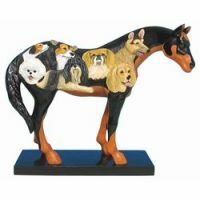 Pure breeds and mixed breeds alike are gathered together on the form of a horse - another companion animal - that itself has been painted to resemble a Doberman Pinscher!